Mesotherapy is the only method to introduce the sterile active substances into the deepest layers of the skin. Needleless mesotherapy is a painless anti-wrinkle treatment that facilitates collagen and elastin production, tones up, hydrates and firms the skin. Due to electroporation meso sense is nearly as efficient in inserting active agents like hyaluron acid, vitamin complexes into the deeper layers of skin as the traditional, needle mesotherapy (mesolift). The electrical pulses emitted by the Meso sense machine momentarily disrupt the cell membrane, allowing the entry of active substances. When the pulse ceases, the cell membrane returns to its original structure. Electroporation dramatically increases skin's permeability. The invisible, but real "channels" created in the skin cells for just a few seconds are allowing us to send any kind of active agents (independently of molecule weight) down into that deeper layer to make real changes in the skin. During mesotherapy only sterile, completely clean products are allowed to use: they don't contain additives, so they don't cause allergic reaction or infection. Needleless mesotherapy is a safe, painless, side effect free treatment. 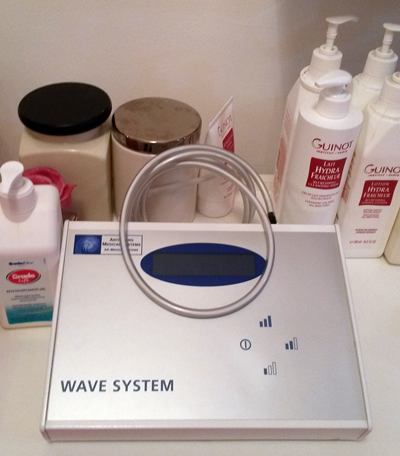 Meso sense treatment can insert up to 90% of active substances into the skin. - beauticians are allowed to use at most 3% concentrated hyaluron acid, which is written on the ampule. Of course, lower concentrations are also available. - your skin, beautician's hands and the treating head are always desinfected.